A report out today from Gartner details worldwide smartphone sales by operating system and show a decrease in market share for Microsoft from 2.7% to 1.5%. They do not break out Windows Mobile and Windows Phone, so it’s not clear if sales of Windows Phone increased, decreased or remained flat. One thing is for certain, during Q3 2011 they trailed Bada, which cannot be a good thing. With iPhone sales dipping in part to customers waiting on a new iPhone, there were simply no new Windows Phone devices on the market. Last week, there was a big push on the part of Microsoft, with a big unveiling of the new AT&T Windows Phones. This comes at a time when the iPhone 4S is expected to pick up steam and Android will also see a boost thanks to the Galaxy Nexus release. 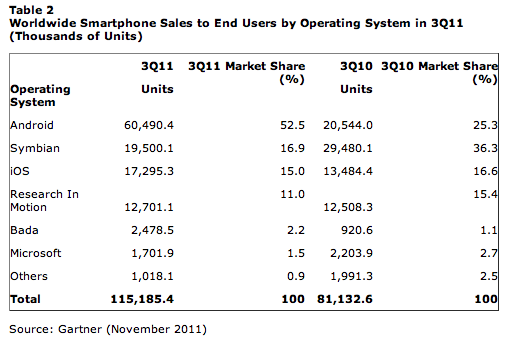 Google saw Android take 52.5% of the market. The field isn’t getting any less competitive.